Melaka and George Town, historic cities of the Straits of Malacca, are renowned for their multicultural heritage. These ports were located at a strategic position for the 15th - 18th century trade between Europe and Asia. Their culture and townscapes further evolved after being colonized by the Portuguese, Dutch and the British. In George Town, the historic city centre has been named a WHS. 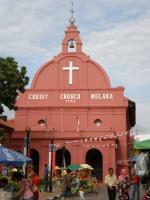 Melaka has two designated areas: St. Paul's Hill and the Historic Residential and Commercial Zone. 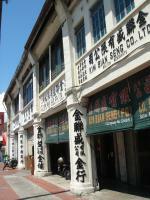 The latter holds over 600 shophouses and town houses. Melaka has been compared to Macao, Hoi An and Galle. But I would like to throw in another comparison: Ping Yao. Melaka's contemporary feel is very Chinese. And the hundreds of shops, residences and temples did remind me of the Chinese WH town. It also seems to attract a lot of Chinese tourists (though they might be native to Malaysia or Singapore). The best known view of Melaka however is that of "Dutch Square", with its Town Hall (Stadthuys), Clock Tower and Church. They don't look very Dutch to me, probably because they (the Brits, the Malaysians) have repainted them with red paint. No sober Dutch would ever do that. A couple more Dutch remnants can be found a little uphill, at St. Paul's Church. They are mostly tombstones of 17th century Dutch citizens. So what's the verdict on Melaka? In general it's nice enough. But there's no real highlight here. During my 1.5 day stay I strolled through town a couple of times and spent half a day on a recommended biketour to the surrounding countryside. Two times I have visited the Melaka. First in 2001 and second time in 2012. I like the place and try to learn the history on it. As much as there isn't much noise being made about George Town, and that unanimous praises are given to Melaka, I was surprised to find out that the former component would be the highlight of this inscription. The character of George Town is more presentable, in my opinion. I visited the two historic cities last May to finish off the list of current Malaysian WHS. Melaka has a rich history, its role in regional trade cannot be underestimated. Sadly, I think that its current condition, however, does not live up to it anymore. Without knowing its past, the town simply looks like any other Chinese-Malay town (can be akin to Hat Yai, in fact). The city's important monuments - representing various cultures and periods in its colonial era - can easily be explored in a day, on foot. We started off in the residential/commercial portion of the inscribed site, across the bridge over Melaka River, and nothing really stood out. The Street of Harmony is nice, but is not as spectacular compared to that of George Town. Jonker Street was a bit sober and empty then as it was post-election time and most shops were closed, in protest against the recent results. The spirit of Jonker Street, nevertheless, went to life when I visited some of the shop houses, learning some few things from store-keepers about the items that they sell - that made me feel that I was truly in a multi-cultural trading town. The Red Square is small, and this happens to be the most extensively used area in Melaka advertisements and promotions. I have to agree that it is picturesque, but pretty much that's only it. The red color in the city is often seen as cute, but I'm not really sure if I share the same assessment. The better part of Melaka is the A' Famosa - St. Paul's Hill. I felt that these are the only parts where one can really have a feel of its past. The St. Paul ruins also offers a commanding view of the city and the straits. George Town, on the other hand, was a real surprise. I think that the multi-cultural aspect of the inscription is better seen and felt here. I enjoyed going around the city on a bike. 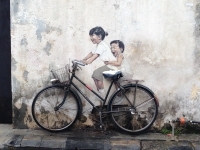 Aside from major WHS monuments hopping, there are other things to do here like checking out the street arts -- which has become a craze after a Lithuanian artist did some wonderful works in the city --, and surveying the famous Penang dishes. Food tripping is one thing that any traveler should not miss in George Town -- I did the gastronomic tour with 2 (Indonesian and American) dorm-mates in the hostel I stayed at, and all of us were really amazed. There are more monuments in George Town, and they are more grand, more colorful, and better maintained than those in Melaka. 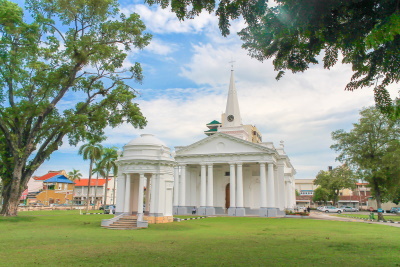 Key British legacies include the impressive city and town halls, the bit worn-out and empty Fort Cornwallis, the two churches, and the colonial-era buildings along Lebuh Pantai. Looking at old photos of George Town, there happened to be more British colonial buildings that stood in the city before, creating a real "Little Europe" atmosphere back in its prime days. Furthermore, I enjoyed this city a lot as local colours are pretty much alive here - its Little India, for example, is one of the more authentic Indian quarters I've seen so far in Southeast Asia. In fact, in experiencing the Straits Chinese-Malay culture, I recommend the Pinang Peranakan Mansion in George Town to be better than the Baba Nyonya Museum in Melaka. My favorite parts of the city would be the Kapitan Keling Mosque, the City Hall, Khoo Kongsi and the Teochew temples, and its humble backpacker's district. Key to a better appreciation of these sites is to see each holistically, understanding the diverse nature that each has to offer - its all about the complex cultural melting pot that they are. As with any Southeast Asian trading town, I think that the biggest threats at present to these two cities are urban developmental pressures - buffer zones on both are obviously weak in some parts. I visited Penang this March. My best impression actually is about two Buddhist temples within the urban area but probably even outside the buffer zone -- the Burmese and Thai Buddhist temples just facing each other across a narrow street. They especially endear me because their presence in Penang add significant claims to this place being a crossroad, not just for the main ethnic groups in today's Malaysia and the country's former colonial rulers, but show Penang as the meeting point of continental and archipelago South East Asia, as where the majority Buddhist and majority Islam zones touch. I had been stayed in Penang Island for several years, the old Georgetown is my only favorite place for its nostagic ambient. There are several issues Georgetown has to confront with after receiving her WHS status. Many haphazard high-rise hotels are sprouting inside the heritage zone to cater for short-term influx of tourists may backfire the goal of heritage listing. Unesco folk has warned Penang government such unplanned development could jeoparize Penang WHS status. Besides, many old buildings are torn down illegally or collapsed naturally to make way for the modern world may turn Georgtown into another dull and boring Chinatown in Singapore. Melaka river face lifting project has also killed off a traditional tug boat logging industry at the estuary. A heritage link to the past is lost forever. Melaka historic centre is basically a very small area covering with many redish buildings in one part before crossing the bridge, and more 'historic - old' buildings on the other side of the bridge. My children and I celebrated Penang's inscription as a UNESCO heritage city by joining the street procession organized by the state. It was part of a three day affair which left us exhausted but exhilarated. For my young kids, the experience is unforgettable since it was not easy to get an opportunity like that again. I'm glad to know that Georgetown have been listed in the Unesco World Heritage list, my hometown which I missed so much. I frequently shout praises for the myriad of cultures and colours found abundant in Malaysian cities, and in particular Penang, to my Australian mates. I look forward to coming back home for a holiday next year. The first cultural world heritage site of Malaysia is the historic areas of two port cities in the famous straits of Malacca, Melaka and George Town, in my opinion, these two cities are the true examples of global cities influenced by almost every great maritime country in the history; Malay, Indian, Portuguese, Dutch, Chinese and English. I only visited George Town, the capital city of the State of Penang, in October 2008 as a day trip from Kuala Lumpur by plane. At first glance, Penang Island was very busy island with lots of traffic, high rise buildings which was a typical image of normal large Asian city, but in the historic quarter, the atmosphere was totally different. The old area of George Town can easily be divided into two parts, the small colonial district and the very large shop houses area that include china town and little India districts. For the colonial area, there are some nice British colonial buildings, but to be honest, these buildings can not be considered to be outstanding especially if you compared with Singapore's colonial area or other beautiful colonial building of French Hanoi or Thai-adopt colonial style in Bangkok. The real major draw card for George Town is the shop house area; the shop house buildings can be considered a unique style of architecture in Southern China and Southeast Asia with interesting mix of Portuguese and Chinese and using typical European and Malay arts as decorative motif. For me this is not my first time to encounter this mix and match building style, I have seen such buildings in other Asian cities, so to consider George Town as a unique city is totally impossible. Interestingly that in ICOMOS document, Singapore and Phuket are used for comparative study since they are both important port cities in the Malacca Straits, and from my experience, the shop houses in those cities are much nicer, more colorful and in good shape than the buildings I saw in George Town. The fact that George Town is able to preserve its very large historic area quite intact making George Town to jump out the pages from others in this particular region. However, the old quarter of George Town can not be regarded as being a nice old city, restoration is urgently required and the traffic and sanitary standard need to be reorganized especially for the road and pavements in china town area. The harmonious of old city is also a big problem, there always have modern building that located in the middle of old shop houses row, I hardly find an area that is pure 100% of old buildings, and you will notice this problem easily when you watch the old city from observation deck of the KOMTAR building. All in all, George Town is a good example of quite well preserve of bygone colonial era in Asia and need to be visited by all tourists to understand the result of cultural exchange via maritime trade. The real treasure of George Town is not the old town or its history, but it is the unity of different culture and colorful people that make this city a place to remember and do not try to forget tasting the famous Tam Bun Biscuit, a local delicious delicacy, before you say good bye to George Town. As a Council Member of the Penang Heritage Trust, I must congratulate my fellow Council Members whose tireless effort in pushing for WHS listing finally paid off. It would be great if one more Straits of Malacca city is included in the World Heritage Site listing: Singapore. When the British established Penang, it was to Malacca's loss, as they took pains to reduce Dutch Malacca's importance. And then, when Penang was found to be too far north to be a strategic port, it was then its loss to Singapore's gain. The history of these three cities should therefore be considered together. With it - I sinceley hope that Penang will retain and maintain her cultural charm, and not to hollow out her city center like many of the cities around the region. Other than retaining the hardward, it must continue to retain her software - it must have the body and continue the cultural soul. The straits shop houses, the clan association, etc are uniquely to this region, and hope that it will not fall prey any longer to commercialism, like her once sister city down south. Having been a Penangite all my life, this is certainly great news to Penang and its community. To be listed in the Unesco list together with other great sites like Angkor Wat, Borobudor and the Historic City of Ayutthaya is simply a great recognition and deservedly so. Well, there's a lot more work to be done in preserving these heritage sites but let's rejoice the moment for this long-awaited award. As a Penanghite, I proud Georgetown and Malacca announced as UNESCO heritage Site in 2008. Currently I travel lot between Minneapolis, USA - Penang on business trip and occasionally travel for vacation. Penang always in my heart as I am spiritualism to the place calls Home and it always home. I encourage and promote Penang to co-workers in US and friends all over the world to visit fantastic tourist spot. It is rich of culture and heritage, Penang also a northern hub for business for trade industrial zone and well known as 'silicon valley' of Malaysia. Beside Penang, Malacca is my favorite place to visit too. Malacca remember me how great of Malay Kingdom that fell down to Portuguese, then Dutch and finally to British. It tells you the story line where the Malaysia begins. Congratulations for George Town and Malacca. penang - very nice place. I was born in Penang, and has been working in Malacca for the past 3 years.. i love both places, there is a lot of interesting places to go, or you can just sit and watch to understand your built environment.. The British East India Company (EIC): The Island of Penang was ceded to the Briitish EIC in 1786 and Fort Cornwallis was created by it to protect the island and became its administrative centre (See link) in 1826 Penang, Malacca and Singapore were merged into the Straits Settlements but still under EIC control. In 1867 they were made Crown Colonies. Sir Stamford Raffles: Raffles served in both Georgetown and Melaka. In particular he persuaded his superiors to drop a plan physically to destroy Melaka when it came under British control during the Napoleonic wars (with the objective of assisting the development of Penang instead). The Nomination file states "Further destruction was timely stopped by Thomas Stamford Raffles, agent of the EIC, who happened to be visiting Melaka. His report on Melaka to his superiors stated that, ? ?the name carries more weight to a Malay ear than any new settlement could," and indeed, ? ?with the assistance of Malacca, the whole of the Malay rajas in the Straits and to the Eastward might be rendered not only subservient but if necessary tributary". Regarding Georgetown the nomination file states "Young Stamford Raffles,... worked at Government House in what would later become Convent Light Street grounds, as Assistant Secretary under Governor Phillip Dundas". Zheng He: Malacca - Visited on most of the voyages. He established one of his bases of operation there and, under Chinese protection against an expansionist Siamese monarchy at Ayutthaya, Malacca flourished. Malaccan folklore believes that Zheng He brought a Chinese princess (together with many Chinese retainers) with him who married a local Sultan. The progeny of all these Chinese formed the basis of the Straits Chinese population. Repainted in a different colour: Melaka: Originally, the Stadhuys like the other Dutch administrative buildings in South East Asia was painted white. However, after Melaka was handed over to the British, it was re-painted terra cotta by the British in 1911.